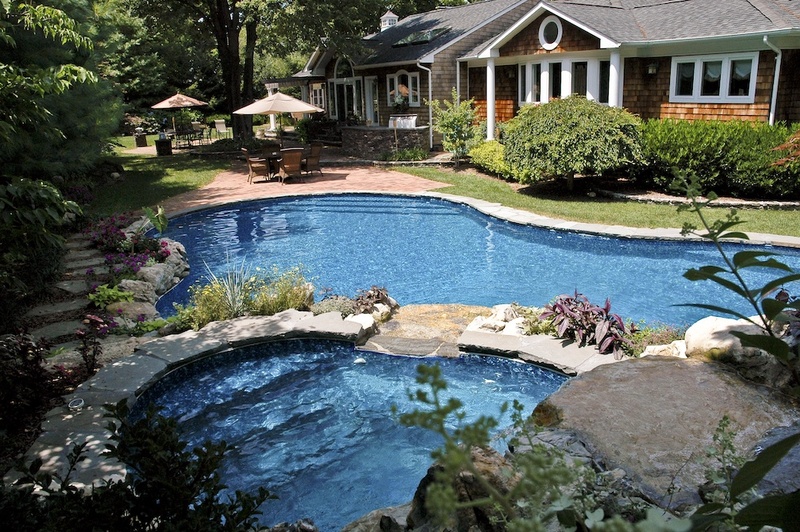 When the homeowners of this dramatic backyard swimming pool oasis originally built their home, it was designed with care not to disturb the property’s mature maples, oaks and pines. So when Deck and Patio was later brought in to upgrade their outdoor living experience, we naturally were just as careful. — plus a koi pond. Dave adds that the each feature had to fit with nature and this particular landscape. Besides our technical knowledge, such an accomplishment requires a true passion for nature in order to balance the relationship between architecture with its natural surroundings. “Needless to say we were thrilled to have been recognized for what accomplished in the design and installation of the pool, spa and water features: We won two prestigious awards from NESPA and APSP for the upgrade. This concrete pool has a vinyl liner. We positioned it into the natural surrounding landscape considering carefully any existing trees and mature shrub root systems. Although it’s not seen in this photo, the clients can enjoy the nearby koi pond and waterfalls while relaxing in their spa. The spa also has its own overhead heated waterfall, which can be adjusted to cool in warmer weather. This 5’ high multi-level waterfall and 35’ meandering stream discharge into 10’ x 15’ freeform Koi pond (below). Pond was built to protect the fish against natural predators. Pond’s small cave, for example, provides a hiding place where koi can lay dormant during winter months and hide when necessary. 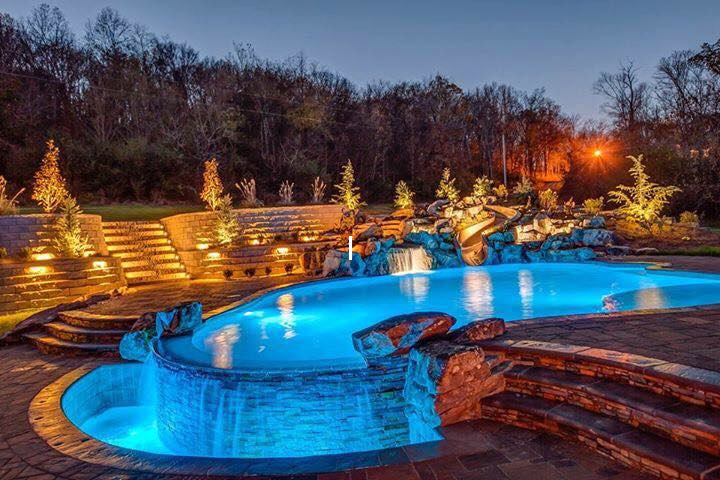 The design of this pool and spa appears “organic” with its natural surroundings; they perfectly fit with the clients’ desire for harmonious bodies of water in keeping with their natural looking residence, patio, outdoor kitchen. 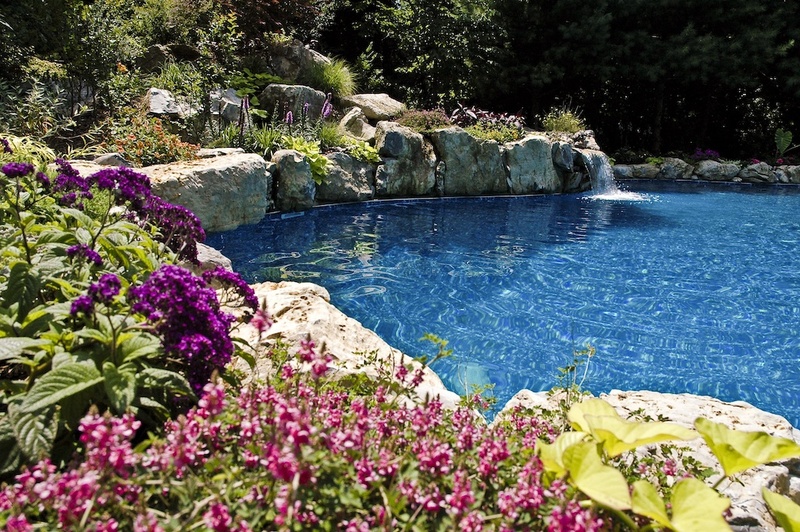 Vibration flowers and fragrance is provided by many varieties of perennials, evergreen and deciduous plantings — planned for successional color throughout pool season. 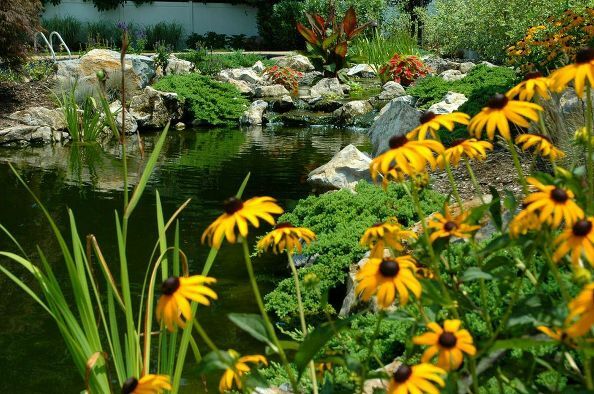 A low-maintenance pond is one with an ecosystem that works naturally with Mother Nature to keep the pond clean and clear. 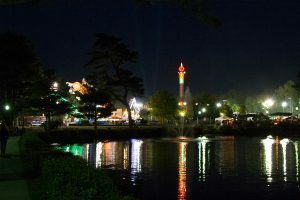 It is a paradise for families to relax by and study throughout all seasons. It also offers a healthy place for desirable wildlife, such as pond fish, birds, etc. 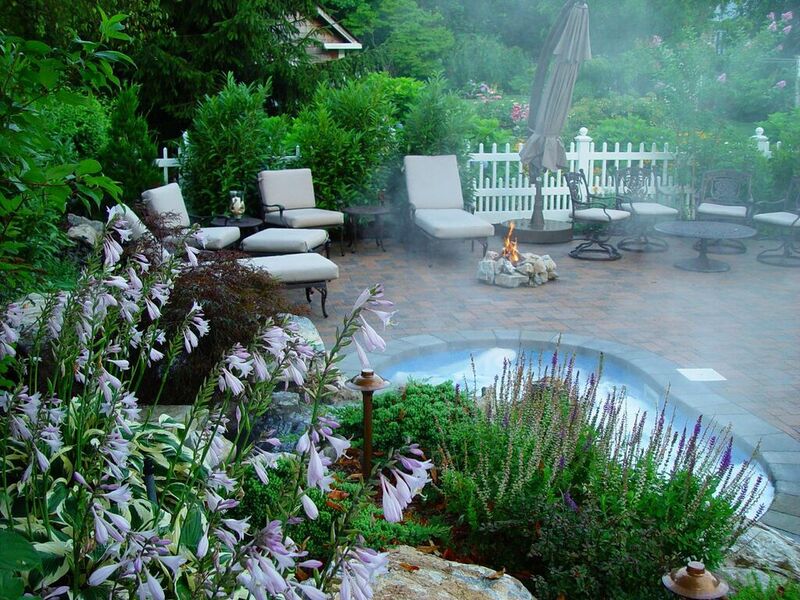 Such a delightful backyard feature has several elements that contribute to its overall harmony. 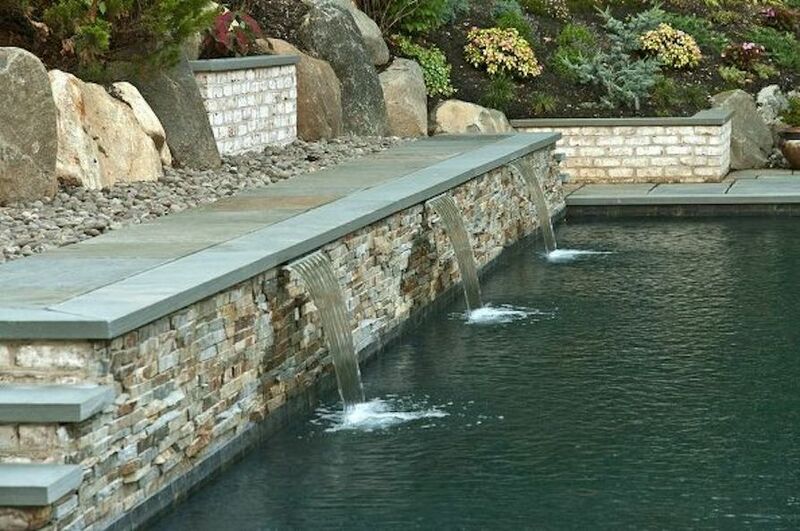 As certified Aquascape Inc. contractors, Deck and Patio keeps regularly up-to-date with the latest in pond design, construction and maintenance. 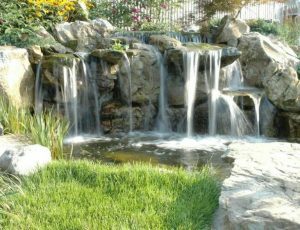 It is essential that any water pump be adequate to the size of your pond and waterfalls. This ensures the amount of water will be aerated sufficiently and will not stagnate or develop excessive bacteria. Instead, the pond receives adequate oxygenation to remain healthy. 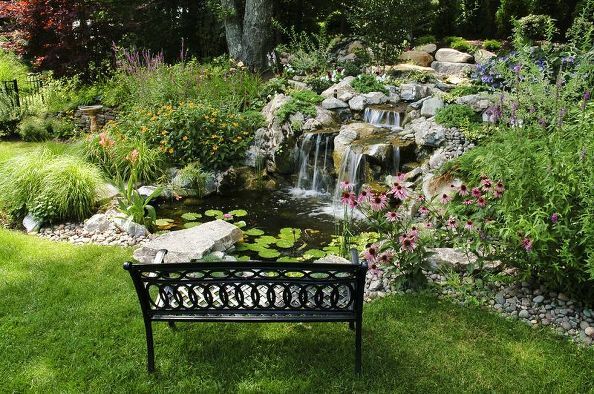 Ponds should also include a natural filtration system using the right biological filter and mechanical skimmer. 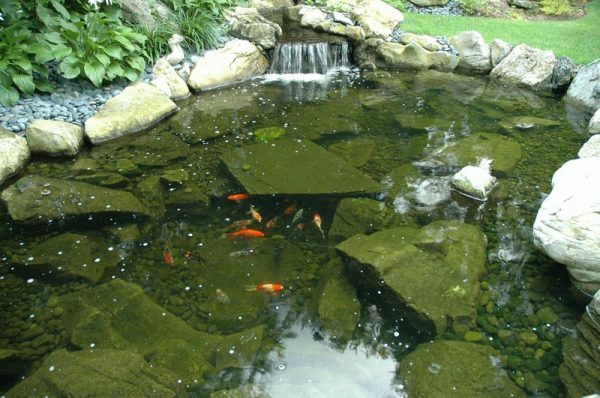 Adding rocks and gravel over pond liners will also allow beneficial bacteria to grow for fish to graze on. Koi, in all their jeweled colors, are not just beautiful to look at. They eat algae, and their own waste turns into fertilizer for pond plants. 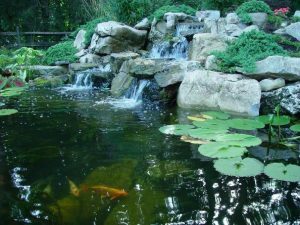 It’s key, though, not to overstock your pond so the balance of fish waste, verses what is being used up, remains in proper balance. And you thought plants, too, were just pretty faces. No, they also play a key role in filtering a pond’s ecosystem. Aquatic plants absorb nutrients from the fish waste. 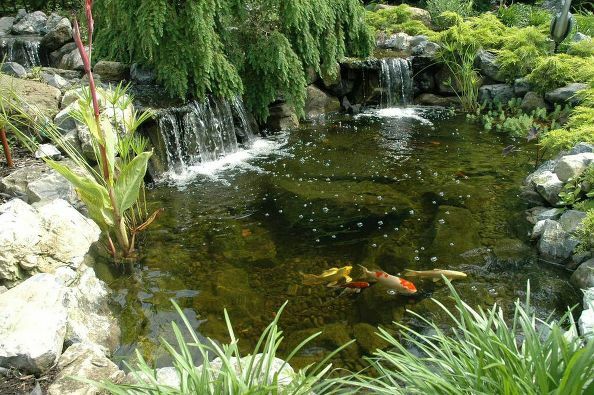 “In the heat of summer, for example, it’s ideal that approximately 40% of your pond’s surface be covered with plants. Not only do they take care of the algae they also provide shade for the fish when it’s hot,” says Dave Stockwell of Deck and Patio. 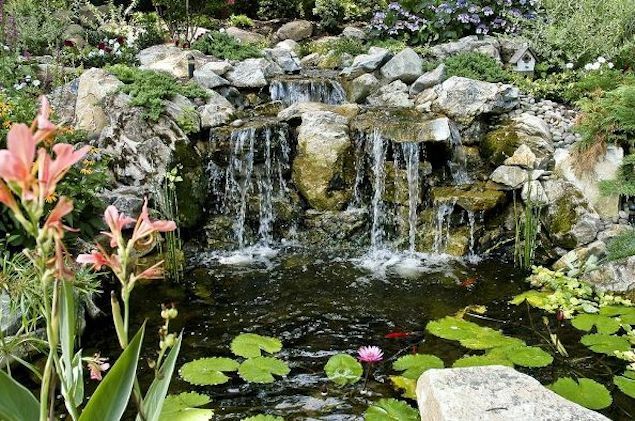 This captured water never stagnates, says Brian Helfrich, construction manager at Aquascape, because the water is continuously circulated in the pond via a waterfall, or stream, or pond fountain. 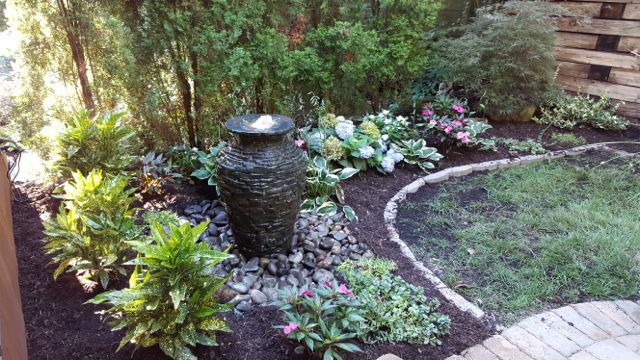 This beautiful award-winning water feature (silver medal from LIPSA) consists of a stream, waterfalls and pond; it’s the perfect spot for letting the day’s cares melt away. Enchanting Echinacea (coneflowers) and magenta Lythrum are some of the plants brightening this pondscape. Water is the basis of all successful ecosystems. The second you put in a water feature you attract all kinds of wildlife — birds who want to bathe, frogs, salamanders, and insects that the birds feed on. Contrary to popular belief, fish will actually reduce pond maintenance, as they graze on string algae and bottom feed from the pond floor. Plants shown here include bullrush, pink canna lilies, horsetail, and a rose arey hybrid water lily. Changing a liner pool to a gunite, (or a gunite to vinyl) is a bit of a job. Since there’s some tearing up going on anyway, this is a great opportunity to create the haven you’ve been desiring. 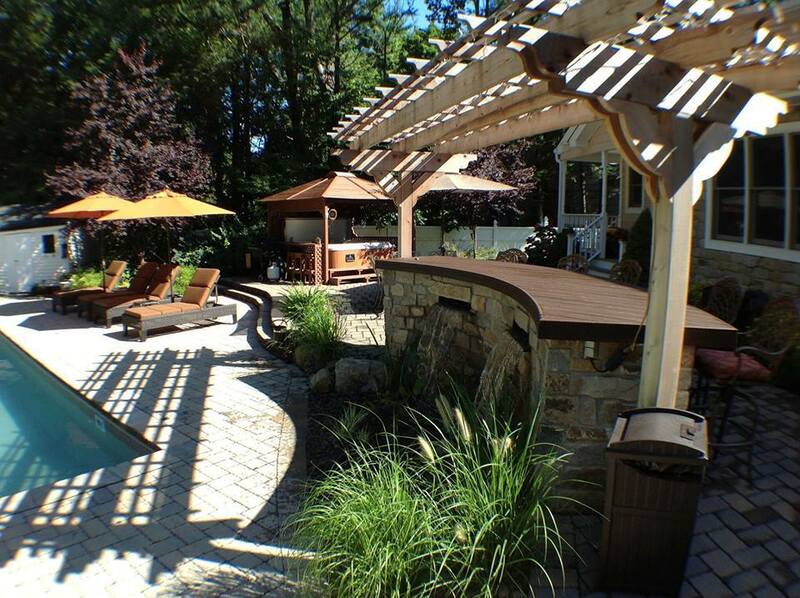 That is exactly what evolved when these Oyster Bay Cove, NY, clients approached Deck and Patio a while back. 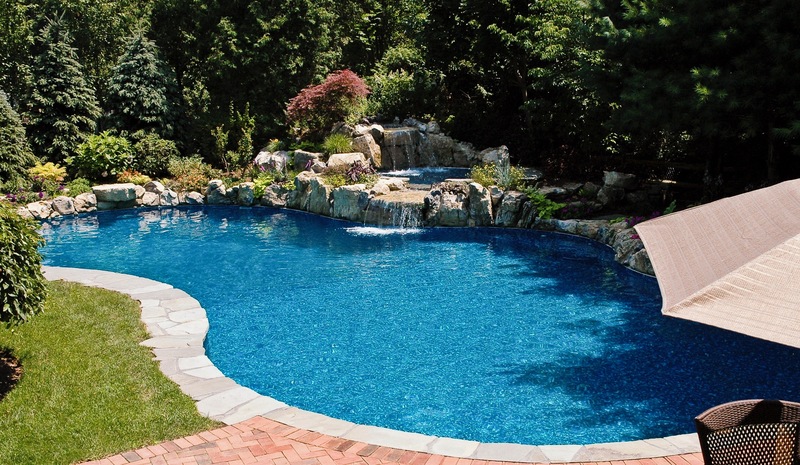 The family wanted a change from their existing vinyl-lined pool to a gunite. 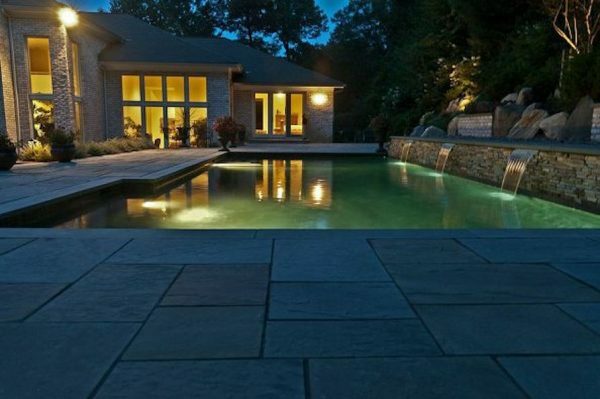 But during our consultation, it became clear they wanted more than a change in pool materials. They were also unhappy with the pool’s shape/design which didn’t fit well with the architecture of their house. And despite the steep grade that limited construction in their backyard, they really wanted an overall larger pool. Our design team also helped create a more unified look with their contemporary home by designing the upgraded pool in a geometric pattern. “We also tracked down the same brick used on their home’s exterior,” adds Dave. 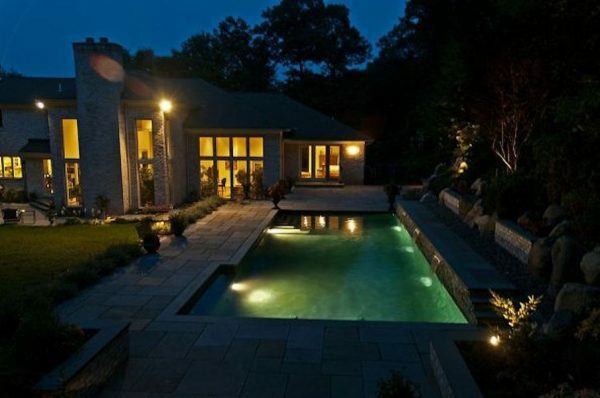 —and landscape lighting created a beautiful romantic scene at night. When the whole transformation was complete, not only was the family ecstatic, but their pet turtles seemed to love the transformation as well. With more room to swim in, they took to the new pool like, well, turtles. On visiting the project after its completion, the lady of the house let us put an underwater camera on one of them — and the turtles filmed what it’s like inside the pool as he swam. The pool transformation became a haven for them as well. 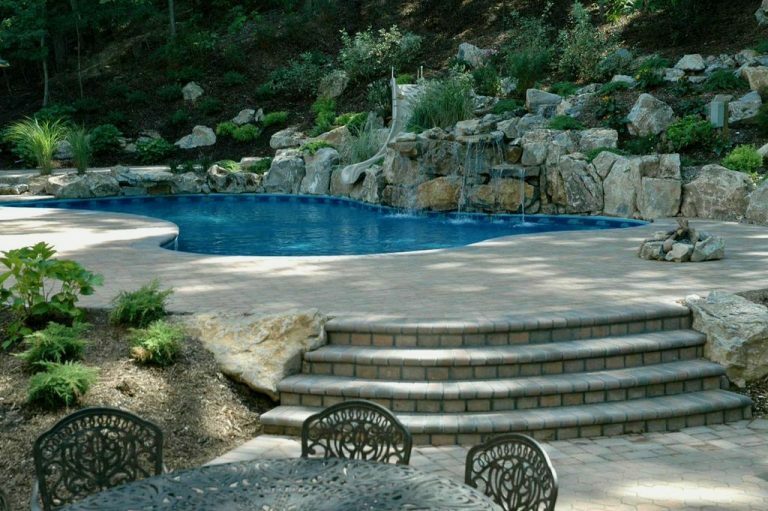 Deck and Patio remodeled an existing vinyl pool into a larger, geometric gunite, with elegant sheet falling waterfalls. The new design handsomely complements the home’s architecture. Steps faced with the same brick as used around the pool’s retaining wall, lead to a peaceful woodland path where the pool equipment has been hidden out of sight. The pavers of the previous patio/pool surround had not been compacted properly and were separating. The family also wanted a more natural product. 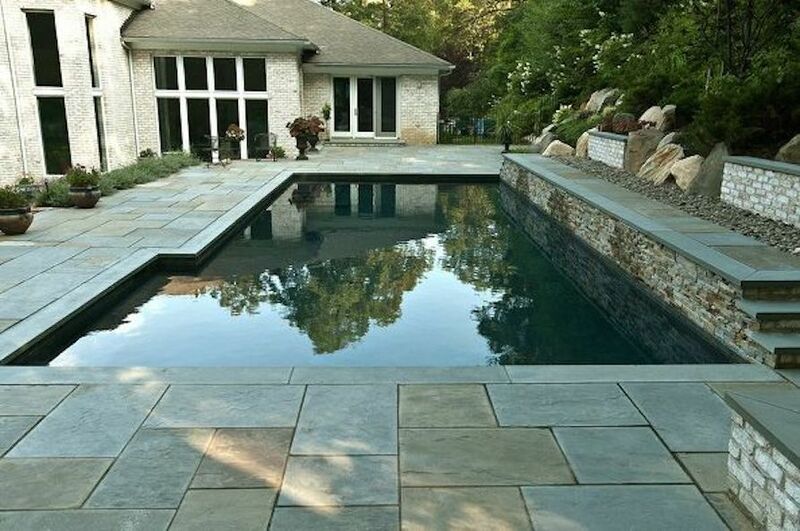 Bluestone was chosen and its hues blended nicely with that of the brick-faced retaining walls; in addition, the rectangular shapes of the stones echo the shape of the pool and house windows. It’s hard to decide which time of day presents the most beautiful picture; but nighttime has to be near the top! 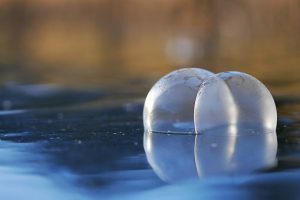 Can Pond Fish Survive in a Frozen Pond? December 2018 weather in Long Island, NY, has hovered around 50 degrees. However, recent news that the Polar Vortex may very soon cause the northeast some winter trauma suggests we should all give a thought to our backyard ponds and especially our pond fish. Can Koi Survive in Frozen Ponds? 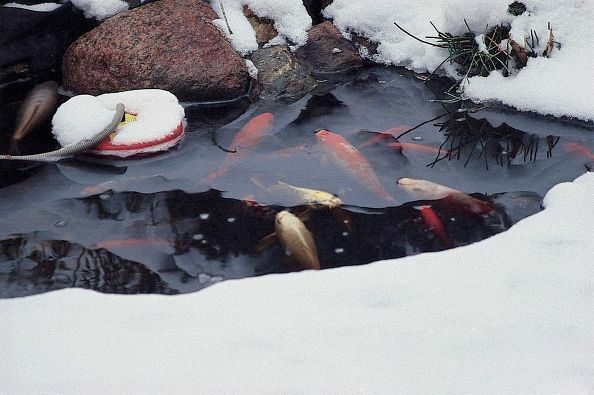 Some pond owners remove their koi for safe keeping in a warmer place. That is not necessary, say experts. However, it’s important to remain alert, especially if the weather gets particularly bad. and keeping a hole in the ice with a heater, bubbler and an aerator, thereby allowing the naturally produced gasses to escape from under the ice. 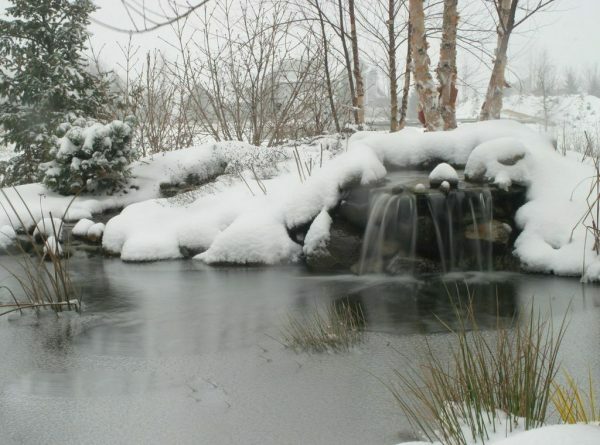 If the above efforts fail to keep it from freezing, Aquascape Inc. designs manager, Gary Gronwick, suggests using a pond de-icer. Gronwick also says to avoid chopping or sawing the ice to open a hole. The noise and vibrations will stress out the hibernating fish to a point they could die. That done, Mother Nature will do the rest. The fish will spend the entire winter hibernating at the bottom of the pond, or in a cave designed for this, and then will slowly wake up as the water warms in the spring. The fish do not need to eat during this time and, in fact, shouldn’t be fed at all. 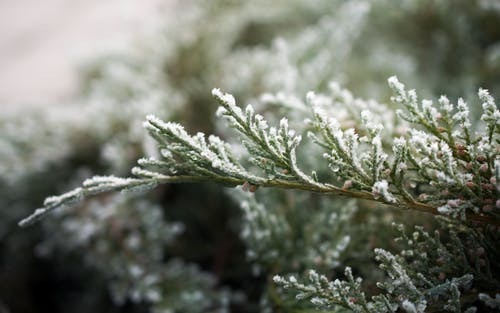 If you haven’t done this already, before any brutal weather sets in, carefully look over your plant material and remove dying plant material. Otherwise, these will rot and build up poisonous gases that can’t escape through ice when it forms. Such conditions might mean that the koi are no longer simply hibernating, but are in a dangerous state of torpor. 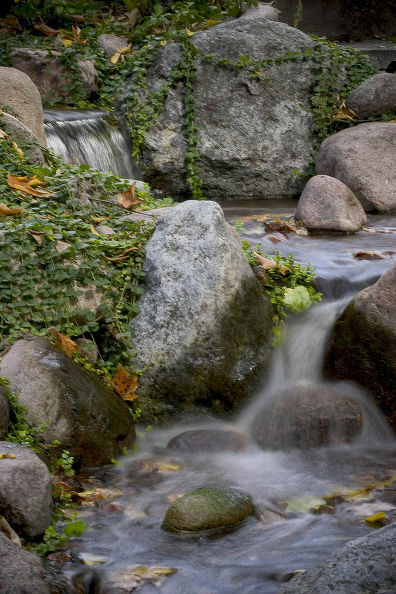 Running waterfalls during cold months helps move the water so ice doesn’t form. But if ice builds up, pond aerators can put bubbles back in the water to add oxygen for the fish. This pond has been cleared of excessive plant material and ice does not cover over the pond so that the fish are happily hibernating. So! 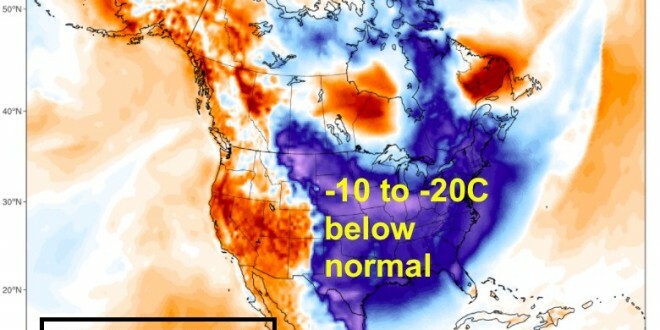 If the Polar Vortex throws us all it’s got, you don’t need to worry too much about your fish. Ensure they have enough oxygen, etc., and they should be just fine. As promised last week, today’s blog is Part II of our focus on landscaping trends for 2019. To further inspire our outdoor living aficionados, we’re showcasing below a few more Deck and Patio projects that, according to trend spotters, are definitely in vogue. 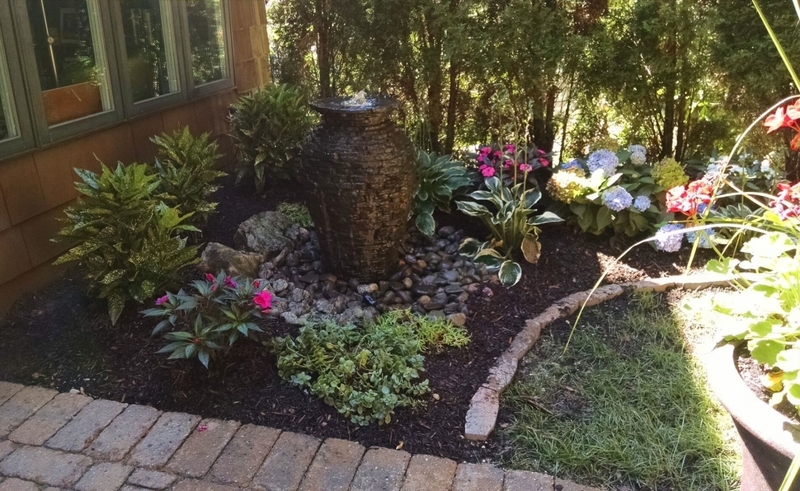 So let’s complete our look at 2019 landscaping trends! 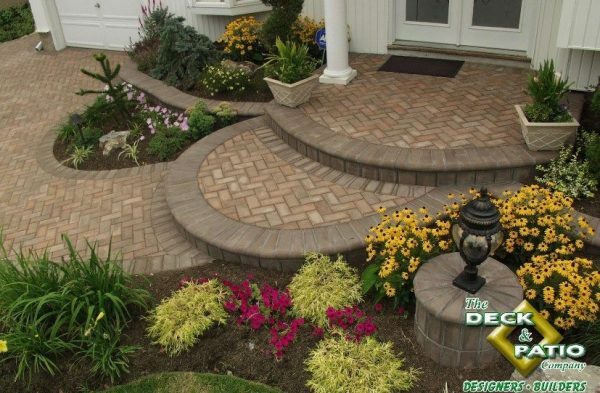 According to HGTV, a neatly trimmed and elegantly paved entryway never goes out of style. Of course, the design can also be stylish. For this entryway, Deck and Patio designed the shape of flower bed cutouts and chose the hues of the plants as complements to the overall tiered paver hardscapes. Even the outdoor light pillar was done in the same paving material for a beautiful — and harmonious — curb appeal. Creating inviting outdoor spaces is key to entertaining, says HGTV. “Constructing outdoor living spaces ideal for entertaining is at the core of Deck and Patio’s work,” says our own Dave Stockwell. 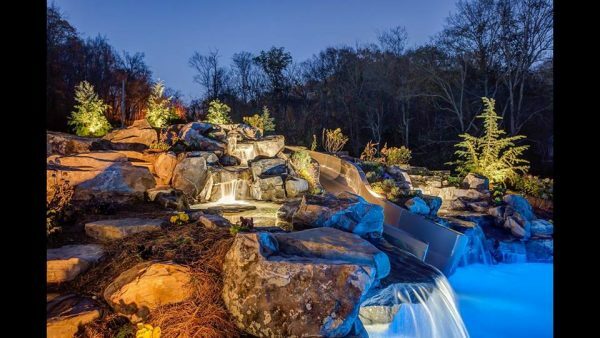 “For the project shown here, we added a pergola over an outdoor bar equipped with two sheet-falling waterfalls. The pergola provides shade for the bar, ideal during the heat of summer. Plus the sounds of falling water encourages relaxed conversation. Adding the sound of water is a huge trend in landscaping. Since fountains come in all sizes there is a right one for just about any outdoor space. Consider this Aquasacpe Inc. fountain that is not only a treat for the senses when the clients are outdoors, it was placed close to a window so they can appreciate it from inside as well. 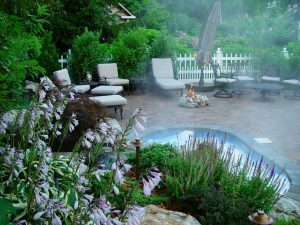 One landscaping trend that continually grows and grows in popularity is the private outdoor escape. For these clients, the “garden” serves several purposes. Planted directly into the slope, supported by massive rock steps, it becomes part of a lovely “natural” retaining wall. The upper patio area is surrounded by lush greenery, bright plantings and a tranquil waterfall. Whether one escapes here to read a book, meditate, or just relax and listen to the sounds of flowing water and chirping birds, there’s a reason garden rooms are a popular landscaping trend. 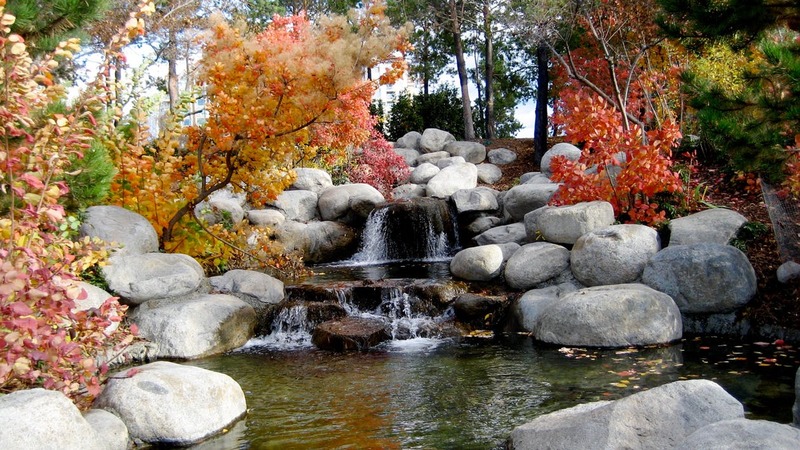 Well designed landscapes are inviting as a place to refresh to soul. 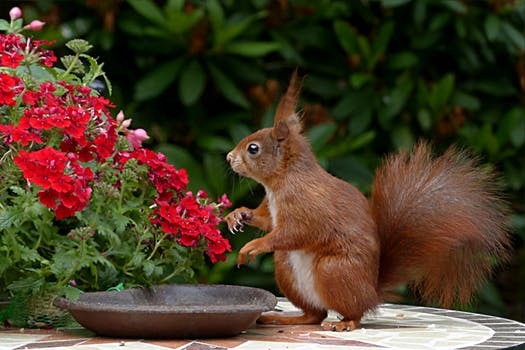 Lush landscapes aren’t just havens for humans. A bit of lavender, for example, is one example of flora that will draw butterflies. And a bird bath (see feature photo at top of page) won’t just be a rest for your avian friends. 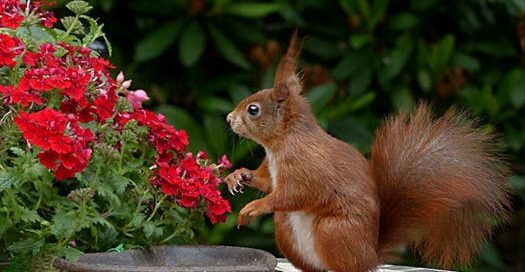 Other amusing critters can’t resist a nice spot for refreshment. Are you yearning for a bit of outdoor whimsy like attaching a swing to your pergola? 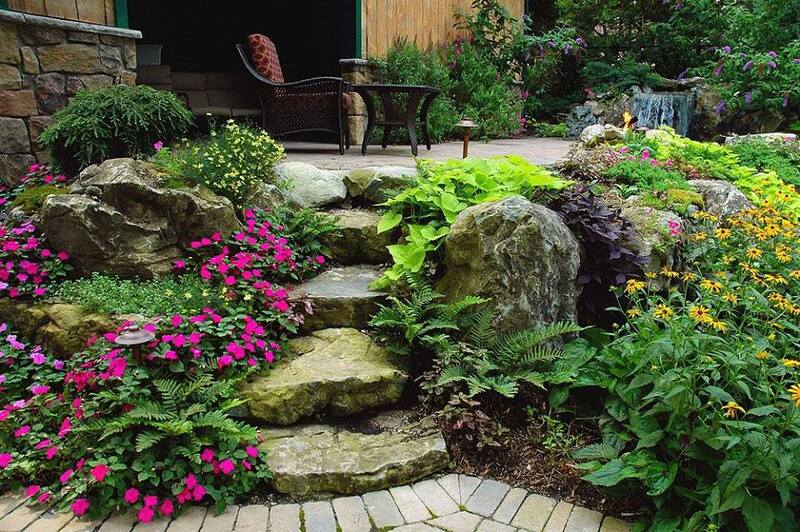 Or perhaps you’re hungering for backyard woodland garden design? 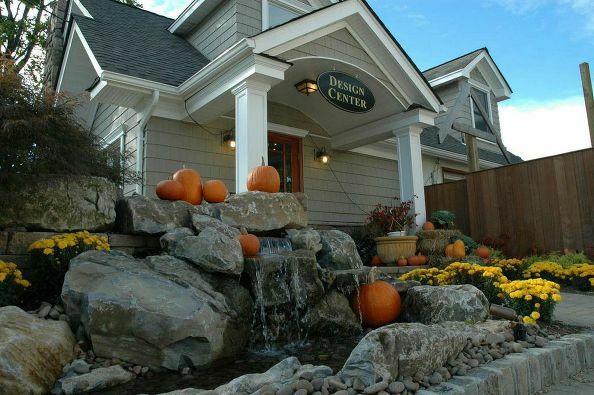 Maybe you’ve been asking your landscaper to come up with a stylish entryway to your home? If any of these fit your mood lately, you may be what the pros call a trendsetter. Because these very ideas are some of the emerging landscaping trends for 2019 according to HGTV. Deck and Patio was particularly delighted to note that water features continue their rise in HGTV’s landscaping trends. 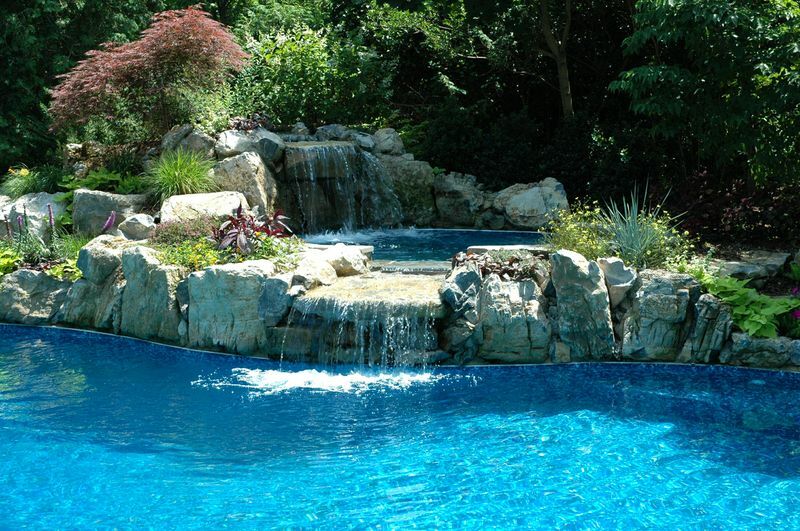 Ponds, streams, waterfalls, including pool water features, with picturesque viewing areas, are specialities of our firm. Here is another Pool Kings project which was highlighted on one of their HGTV television episodes. The water feature project was in Tennessee — quite a distance from our usual Long Island, NY, area of operation. We don’t know if this qualifies as whimsical, but it definitely is unique, imaginative and totally unexpected we believe. 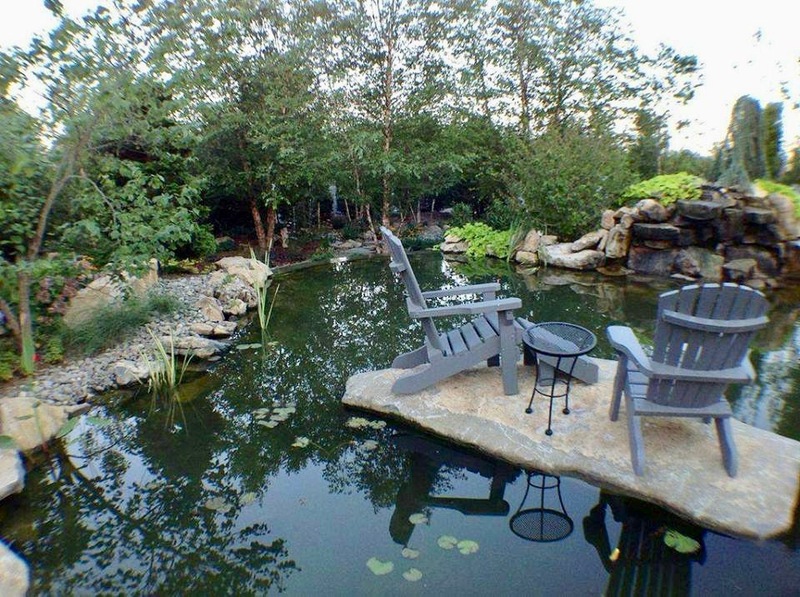 It was a Deck and Patio design idea we suggested when building a backyard pond for clients. We added stepping stones (unseen) which go from their new patio out to the large stone island where they can escape to relax and enjoy their pond up close. 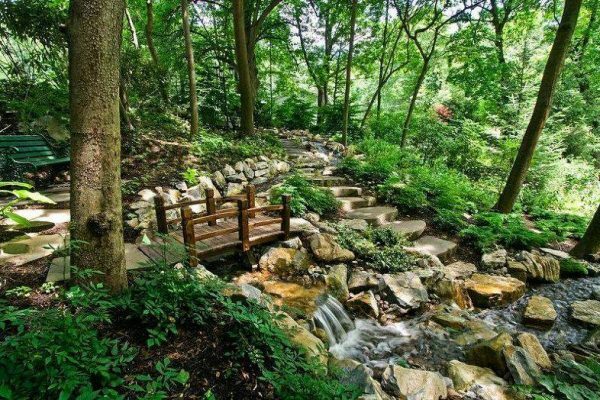 These Deck and Patio clients had a beautiful wooded yard with some pre-existing nature walks. They also had a bridge. We designed stone steps, streams, and waterfalls in an around the bridge, just below a comfortable park-style bench. 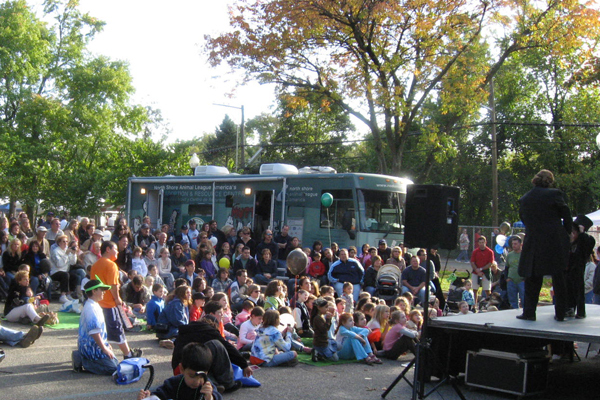 In addition, we added beautiful ground cover and leafy plants. The point was to increase their enjoyment of being out in their own private refuge without disturbing the property’s natural woodland. Next week, our blog will highlight a few more of HGTV trends and how Deck and Patio is keeping Long Islanders (as well as those farther south) landscaped with the times. Peak fall foliage is upon us here on Long Island. And while it’s a glorious sight, for those with ponds, it’s also a reminder to do a little maintenance. 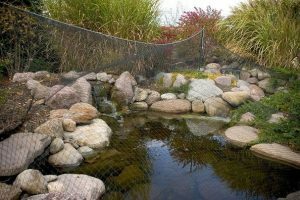 Our blog a few weeks ago suggested netting your pond before the leaves fall. It’s worth doing in the next few days if you haven’t done it yet. Once all the leaves have fallen and been captured by the net, you can simply pull it out and once again enjoy your pond unobstructed. Note: If netting isn’t your thing, a long-handle pond net allows you to scoop down to the bottom and pull out leaves and other debris. It’s a bit more work, but effective. 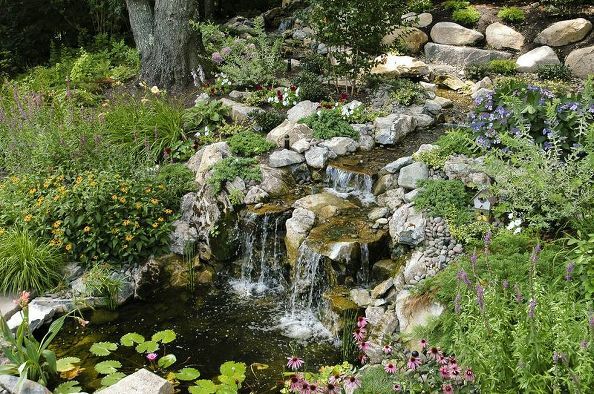 Also, since ponds tend to lose significant water by evaporation during the summer, clearing out debris keeps the pond from getting too shallow and requiring extra water to keep it topped off and healthy. Pond lilies, for example, which are idyllic water plants, tend to need a little maintenance in fall. It’s a good idea to cut them back to just about the base of the plant; also trim back any marginal plants that might eventually droop over into the water. 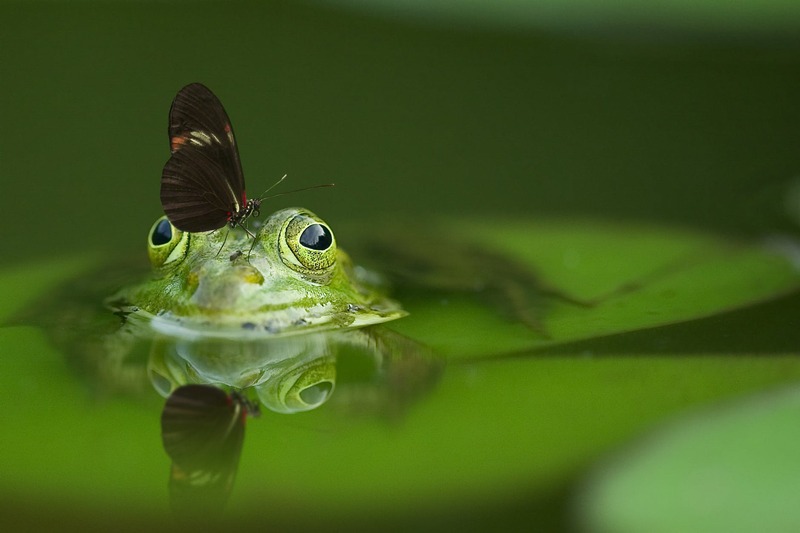 Some debris will make it into your pond no matter how careful you are. Dave Kelly of Aquasacpe Inc. recommends adding a cold water bacteria treatment, which has concentrated strains of beneficial bacteria that works well below 50 degrees (F). Kelly recommends adding it routinely to help maintain water clarity and quality. Photo: Aquascape Inc.
You can — and should — plump up your koi darlings to survive winter hibernation. 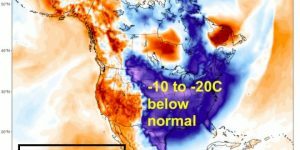 As temperatures start to drop, gradually increase how much you feed them. When your pond’s water gets below 59 degrees, we recommend using fish food made for cold water. Note: As the temperature continues to drop, gradually reduce the amount you feed them. Once water temperatures go below 55 degrees, says Kelly, the metabolisms of pond fish slow way down. And when pond water gets down to 50 degrees, do not feed the fish any more. Their systems shut down in the colder water, and food sits inside them and rots. They get very sick and diseased from this. There is nothing cuter than your koi coming to you for more food. However, once the water gets to 50 degrees, experts say stop feeding them entirely. Once Spring arrives, and your pond and fish are healthy and thriving, you’ll be glad you took such good care of your pond in the Fall. There! That’s not so bad, is it. 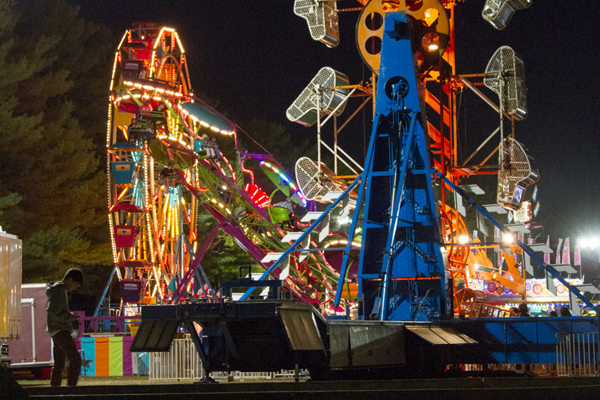 Just remember: a little fall maintenance makes all the difference. Fall is a terrific time to do outdoor upgrades like a new deck or patio. Simple, ground-level expansions can be done by anyone. 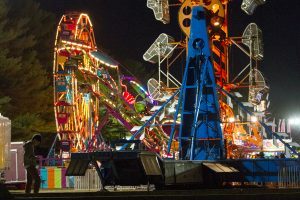 But if your property’s terrain is challenging, or your outdoor living dreams call for more artistically designed spaces, the advantages of choosing a “design-build” firm is worth consideration. Design-build contractors provide the architectural design for a project as well as its construction. This is also true for “outdoor living” contractors like Deck and Patio. On the contrary, adds Dave. Clients find they develop a closer relationship with their design-build project manager, who knows all that’s going on and can easily accommodate their changing needs/ideas as the project develops. As you’ll see from the examples of some of our work that we’ve included today, when it comes to outdoor living projects, having a singular vision — which might include plantings, waterscapes, and hardscape — results in beautifully harmonious backyard escapes. 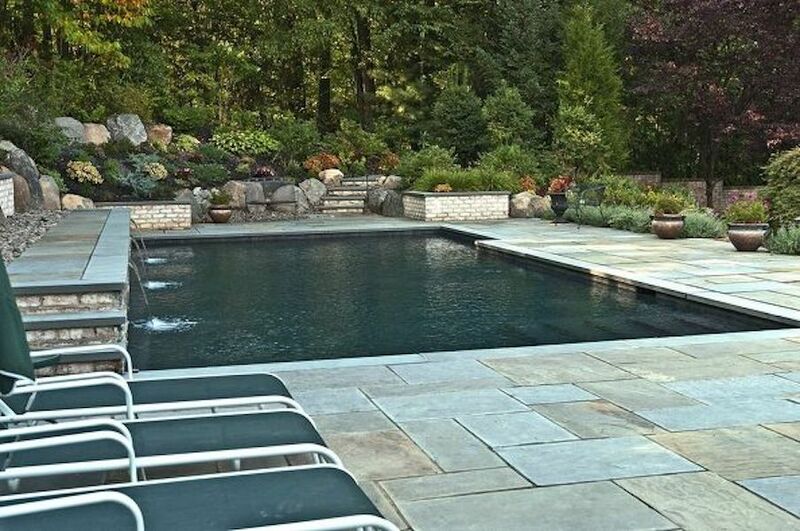 For this handsome free-form pool, Deck and Patio designed a surrounding patio using a design kit from Cambridge Pavingstones with AmorTec. “The kit allowed us to create a very attractive random pattern, with gradations of tones,” says Dave. Plus, adding a water feature on one side of the pool, along with a pool slide, not only was alluring, adds Dave, but the moss rock boulder placements and landscaping were conceived to do double-duty as a natural-looking retaining area for the pool. Designing and building a backyard water feature takes time, especially if you want a man-made feature appear as if Mother Nature designed it herself. 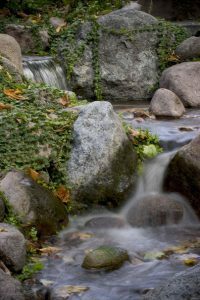 This requires ordering and installing the perfect-sized rocks and boulders that cause the water to flow in natural spills into either a pond or even a pondless-water feature like the one shown here. Sometimes privacy is an issue when designing for comfortable outdoor living. This property, for example, was open on three sides and in full view of four homes. “The clients wanted a ‘spool’ — or a cross between a small pool and a spa — but the best spot for it was in a very exposed area,” says Dave. Deck and Patio’s landscaping design team used Skip Laurels, Leyland Cypress, and Cedars to create an attractive natural privacy screen around the spool. In addition, texture and color were brought in to the buffering divider by incorporating flowering deciduous shrubs. 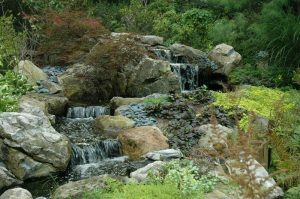 “We also incorporated creeping evergreen ground covers to cascade and wind over and between the rocks we used,” says Dave. 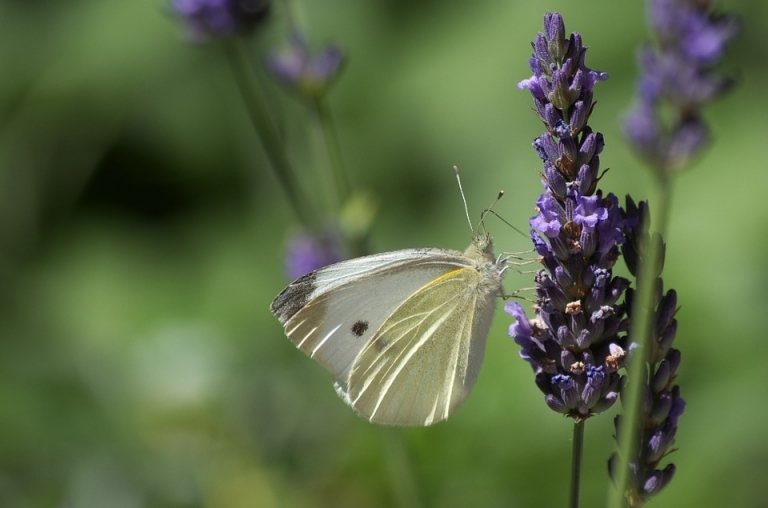 “Plus a careful selection of plants provided the area with color from April through October. The whole design flows beautifully into the back property. For this project, privacy was not an issue for the clients. In fact, they wanted it as open as possible to take in the property’s wonderful views. 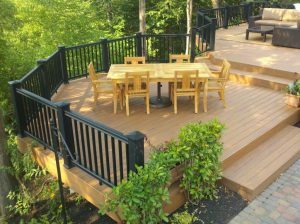 “We designed a 2-level TimberTech XLM PVC deck for them, with one level just for the outdoor dining table, and the other places for deep seating outdoor furniture like chaise lounges and the barbecue,” says Dave. So, as you plan for any fall or spring backyard upgrades, an outdoor living design-build firm may be just be the way to go.